Hotels in SardiniaTasteful and natural, the Sardinian cuisine is a pleasant and unique experience satisfying every palate with its own specific dishes and ingredients, from pasta to meat and fish, strong sheep and goat milk cheese as well as wine made from autochthon grapes. Sweets and cakes are generally prepared with almonds, honey and fresh cheese. Among the most common types of pasta you will find malloreddus, a short handmade pasta flavoured with saffron powder and served with tomato sauce seasoned with fennel sausage and grated cheese, and culurgionis, a type of ravioli with mashed potato filling served with tomato sauce and mint leaves. 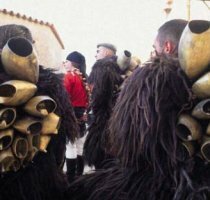 The rooted agricultural and pastoral traditions of Sardinia show such a deep influence on the island cuisine that grilled or casserole lamb, boar and pork are easy to find almost everywhere. The suckling pig, which can be eaten in all the farmhouses (agritourism), is usually between 20 and 40 days old and its weight varies from 3.5 kg to 6.5 kg; the whole piglet is traditionally cooked on an outdoor fire and its taste is undoubtedly excellent. Fresh, tasty Mediterranean fish is another important ingredient of the culinary tradition in Sardinia and it is used to prepare pasta, soups, casserole and barbecues. Recipes are usually quite simple very often including olive oil, parsley, garlic and fresh tomato. The island fish delicacy is bottarga, dried mullet roe cured in sea salt and often served with olive oil as an appetizer or with spaghetti dishes. All vegetables (artichokes, tomatoes, fennels, olives, peppers, aubergines just to name a few) have an excellent taste and most of them may be eaten raw in pinzimonio, an olive oil, salt and pepper dip. From the south to the north, including the coasts and the lagoon areas, the cultivation of grapes and the production of wine have nowadays become extensive. The enological varieties include vernaccia and vermentino (white wines), cannonau, monica and carignano (red wines) among the others. For a smooth digestion, try the excellent Sardinian spirits, like mirto (a local myrtle-flavoured liquor), limoncello or filu 'e ferru (local eau de vie). And finally, do not forget to try the fresh and crisp local lager.